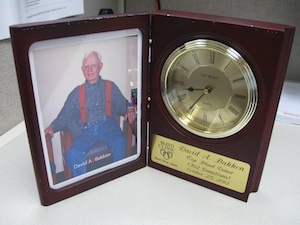 David Bakken's blood donation "career" had an inconspicuous start. Years ago, his young daughter needed eye surgery, and he donated blood as a way to help pay for the surgery. "At that time, they paid $25 for each donation," Bakken recently told KAAL-TV. But the thing is, Bakken didn't stop. He kept donating. And donating. Now, 50 years later, Bakken has donated his way to becoming Mayo Clinic's top blood donor. He was officially bestowed that honor during the Mayo Clinic Blood Donation Center Blood Donor Appreciation event in Rochester, Minn.
"You are doing this thing for the benefit of others, and I think this is one of the best gifts you can give," Mayo Blood Center Director Manish Gandhi, M.D., told Bakken and others who attended the event. Bakken tells KAAL-TV he understands the impact of his donations. And during the past five decades, he says he's done his best to spread that message to others. "I wear my blood donor shirts and hats, and let people know and encourage them," he says. "I know it makes an impact on people that receive the blood." 23 -- the number of times Bakken now donates blood and blood products each year, one shy of the 24 times a year his body can safely donate. 302 -- the number of times Bakken has donated blood during his lifetime. 142 -- the number of liters of blood that resulted from those 302 donations. 1,200 -- the number of lives those at the Blood Center say may have been saved by Bakken's donations, when you consider that each donation has the potential to save the lives of three to four people. Staff at Mayo's Blood Donation Center in Rochester say Bakken is "just a few dozen donations" away from breaking the world blood donation record. And true to form, Bakken says that's a record he fully intends to call his own one day. While Bakken may have taken "Top Donor" honors, he's far from the only one who's given of himself to help others. In fact, Sean Hong, Mayo's Blood Donor Program recruitment coordinator, tells us that of the center's 12,500 donors, 11 have given more than 200 times; 116 fall into the 150-or-more category; and 908 have donated blood more than 100 times during their lifetimes. For more facts about blood donation, including information on how you can get involved yourself, visit the Blood Donor Program's website.